An album as wonderful as its lineup! The name of Dewa Budjana has been spinning in my ears for over 4 years, since I was kindly introduced to his music by Mr. Moonjune. Since then, I’ve been quite fond of his music, mainly due to his guitar style, but also due to the different musical realms he shares and also due to the amazing line-ups he gathers for his albums. 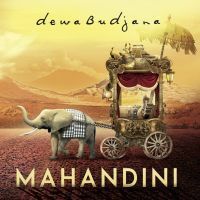 After two years of the amazing “Zentuary”, the Indonesian maestro has returned with “Mahandini”, an album that has the mandatory jazz fusion sound, with the also mandatory Balinese moments, but now with a sound more oriented to rock. This might be because of the musicians recruited for this album. Dewa Budjana always knows how to choose great musicians and also how to adapt the music in order to take the best from them, and now, with the help of progressive rock masters Jordan Rudess and Marco Minnemann, along with Indian prodigy bass-woman Mohini Dey, Budjana has given us a great record. If that was not enough, here the acclaimed John Frusciante collaborates with the composition of two songs which are sung by him. Guitar expert and legend Mike Stern features on one of the tracks as well, while Indonesian artist Soimah Pancawati shares her voice on track three. An all-star line-up! Frusciante might be mainly known for his work as guitar player of the Red Hot Chili Peppers, but he also has a solo career in which his voice plays a main role. For this album he lends his voice for two songs. The first one is “Crowded”, the one that opens this album. Here we can listen to a great piece that has a deeper orientation to the rock realm with even some heavier moments provided by the voice and the instruments. The jazz fusion element is a shadow here, and it is in fact a surprise because it is not so common to see a Budjana’s album opening with a track like this one, that in spite of its delicate sounds on brief passages, it might be remembered more for its explosive moments and even its nice catchy lyrics. “Queen Kanya” continues this journey. The first two minutes have a soft jazz fusion sound but later the music becomes more aggressive, with an evident wink to progressive rock. A piano solo first and then the music explodes, Budjana makes a great and rockin’ guitar that prepares us to one of the albums highlights: the konnakol section. Minnemann and Dey share an amazing passage where percussion and vocals spit countless syllables creating an addictive rhythm, reminding me a bit of some Mahavishnu Orchestra sounds. “Hyang Giri” has the guest voice from an Indonesian singer. This song is amazing, the voice is profound and the music hypnotic. There is an evident Balinese flavor wonderfully blended with progressive rock. I think my description could be short, but the words I chose I think definitely describe this wonderful tune. “Jung Oman” might be the softest and more delicate of the tracks here. It has a very melancholic sound, it is like an invitation to feel clean and relaxed, an invitation to a introspection. The guest musicians continue, and now it’s time for Mike Stern, renowned guitarist who has played with giants such as Miles or Jaco, among others. His career has been long and prolific as solo artist or in collaborations. This time he shares his talent in “Ilw”, a terrific progressive / hard rock song in which his experimental guitar appears adding a great solo. “Zone” is the second and last song with lyrics and with Frusciante as guest singer. This song might belong to any of his solo albums, though the musicians add in moments a soft jazzy spirit, this is more a rock tune for the likes of alt rock fans. “Mahandini” has that Dewa Budjana sound, I mean, when I listen to these arpeggios I already know who the guitar player is, I think it is good to have a own sound, it is very difficult to create it nowadays. Minnemann drums all over this track are fantastic, multi-colored, sharing endless figures, great! After three minutes we found Mohini Dey playing a great bass solo that is continued by Rudess’ keyboard solo. Budjana is never egoist, he always let his musicians to show to the world how great they are. As usual, Budjana has provided a top album. I beg you to discover this man’s music, you will find colorful moments that will guide you to countless sensorial experiences.